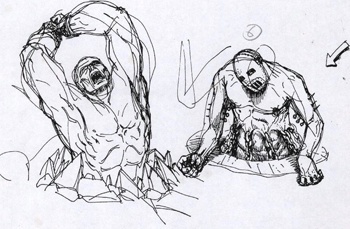 Ten-year-old concept art from Irrational Games reveals some ambitious details about a game based on The Divine Comedy that got stuck in development hell. Before Bioshock, but after System Shock 2, Irrational Games was working on The Lost, a third-person action/horror game that was supposed to be published by Crave Entertainment. Unfortunately, Crave slashed the development budget and the game was eventually dropped from the publisher's lineup. However, the developer has recently let some of the title's concept art out of the vault and given fans the opportunity to see what could have been. The Lost featured a story inspired by Dante's The Divine Comedy, starring a single mother who sells her soul to the devil for the chance to reclaim her daughter's from Hell. Although Crave canceled the title, FX Labs purchased the rights to the game in 2008 and released it in India as Agni: Queen of Darkness (apparently with different art assets). Mauricio Tejerina, who is now an artist on Bioshock Infinite, was an environmental artist with The Lost. Tejerina recently dug up his hand-drawn level and character concepts, providing them to Irrational so they could be scanned and added to the company's archives. The artwork is rough, but it certainly shows off the potential that Irrational saw with this game, and the accompanying interview with Tejerina is a great read. From the sound of things, The Lost could have been a stellar game; maybe Irrational will get a chance in the future to make something similar, both in ambition and in tone.